Have you seen the new AED location sign? Following extensive research and public consultation, the Resuscitation Council (UK) and the British Heart Foundation have developed a new UK AED location sign and a supporting information poster, with the aim of ensuring that more people understand what AEDs are used for and are encouraged to use them. • The lightning bolt icon has been changed to a stylised ECG heart trace – respondents of the public consultation overwhelmingly said they would be more likely to use a sign with this icon on. 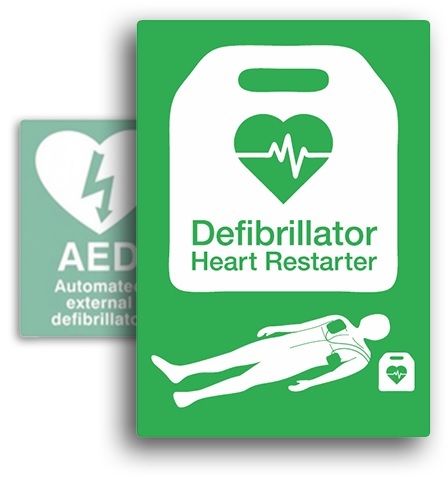 • The description has been changed to “Defibrillator – Heart Restarter” – respondents of the public consultation said they thought this term would most encourage them to use the device. • A supine person has been added, showing the suggested placement of the defibrillator pads, to reinforce (by way of a strong visual cue) how the device should be used. • Anyone can use an AED – you do not need prior medical or first aid training. • It’s easy to use – just follow the instructions. • It is for use on an unconscious person who is not breathing normally. Did you now know that AED is covered on our 1 Day EFAW and also our 3 Day FAW and 2 Day Requalification?